The well-known weaknesses of diffusion-based models of option prices have led to a variety of models involving (in addition to a "diffusive component" driven by an (exponential) Brownian motion) randomly occurring discontinuous jumps. These models are known as "jump diffusions" and form a subset of the set of models driven by an (exponential) Lévy process. The first such model was due to Robert Merton. In Merton's model the jump sizes are normally distributed. Kou introduced a similar model, in which the distribution of jump sizes is an asymmetric exponential. Both models possess certain features that they share with observed market prices and which are not present in the popular Black–Scholes model, such as the leptokurtic feature, but Kou's model has several advantages over Merton's. One of these is the fact that, thanks to the "memoryless property" of the exponential distribution, it is possible to obtain "explicit formulas" for many important types of options. 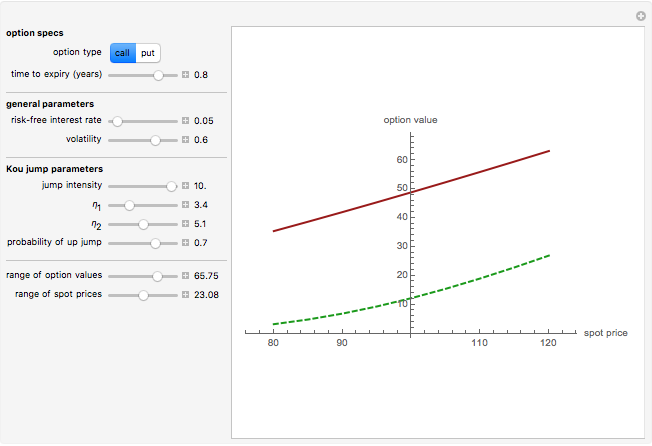 This Demonstration uses such a formula for the price of a European call and put option, shown on the graph by a solid brown curve, which is compared with that of the corresponding option in the Black–Scholes model shown by a dashed green curve. 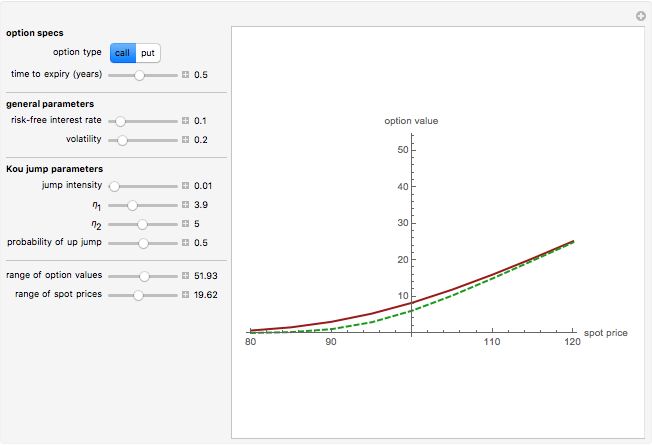 Note than increasing the jump intensity (average jump frequency) parameter will make the jump diffusion price of options increasingly higher than the Black–Scholes one, reflecting the increased jump risk. 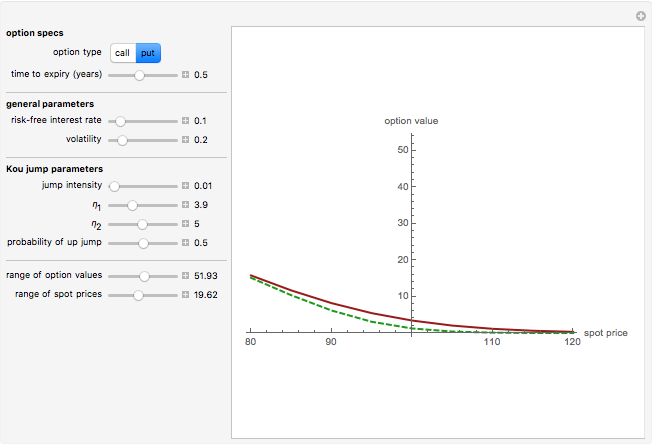 where , , represent the probabilities of upward and downward jumps. All sources of randomness are assumed independent, although this assumption can be relaxed. The model has four independent parameters that make it more flexible and easier to calibrate to fit market prices than the Merton model , which has only three. The model was introduced by Kou in , with an explicit formula (in terms of functions) for European call and put options. The "memoryless" property of the exponential distribution makes it possible to derive analytical formulas for the expectations of various first passage times, which are the basis for explicit formulas for a variety of options . The Black–Scholes model used for comparison with the Kou model has approximately the same variance of daily returns (given by the formula in the footnote on page 1091 of ). R. C. Merton, "Option Pricing When Stock Returns Are Discontinuous," Journal of Financial Economics, 3, 1976 pp. 125–144. S. Kou, "A Jump-Diffusion Model for Option Pricing," Management Science, 48, 2002 pp. 1086–1101. S. Kou. and H. Wang, "Option Pricing under a Jump-Diffusion Model," Management Science, 50(9), 2004 pp. 1178–1192. Andrzej Kozlowski "Option Prices in the Kou Jump Diffusion Model"